According to NerdWallet’s Law School Comparison tool, which pulled post-graduate information from thousands of law school graduates from the classes of 2009 through 2011, Columbia Law School graduates reported the highest average salary across all job categories. According to NerdWallet’s Law School Comparison tool, 7 percent of of Harvard Law graduates are employed in the public interest sector, compared to 11 percent of Yale Law School graduates, 5 percent of Stanford Law School graduates, and 4 percent of Columbia Law School graduates. 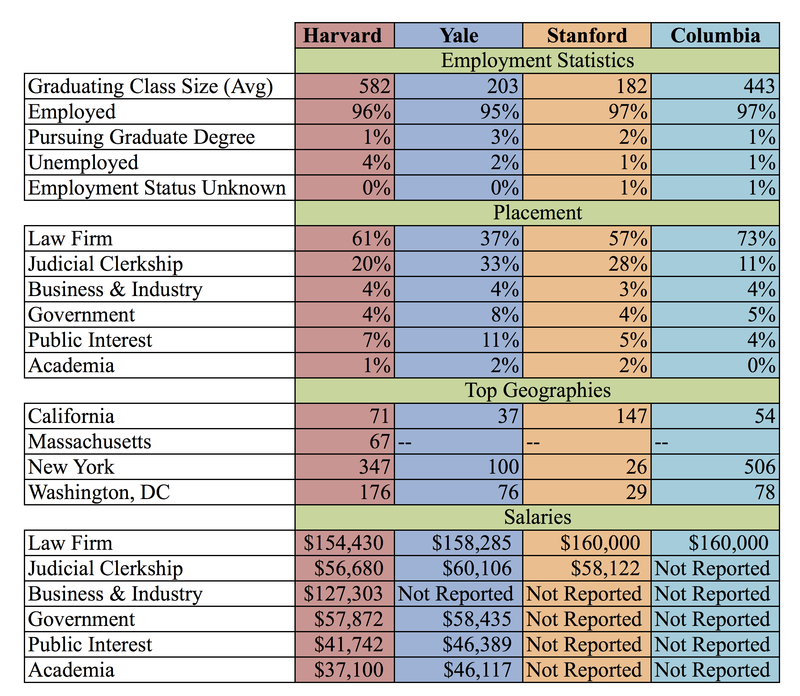 The majority of recent graduates at Stanford, Columbia, and Harvard are employed at law firms, while only 37 percent of Yale Law recent graduates are at law firms. The average salaries of recent Harvard graduates employed at law firms was $154,430, compared to the public interest average salaries of $41,742. Really, we hate to burst your bubble. It pains us to do so. Your first few months of law school have been a blast, click clacking your way up a huge rollercoaster lift, and you have no idea how far you have to fall. It’s late autumn and your peers rush to schedule OPIA appointments. Click. Everyone’s doing something positive for their 1L summer. Clack. And you have no reason to believe that your friends will abandon their ambitions for easy money. Click. After all, how could somebody who did TFA go on to defend the corrupt actors responsible for our national foreclosure crisis? Clack. Or the tens of thousands of cancer-causing chemicals in everyday products? Click. Or the climate change that caused Hurricane Sandy? Clack. Clack. Clack. But defend them they will. Your peers will put aside their hopes and dreams and good intentions. They will position themselves firmly on the wrong side of history, beside the lawyers who defended everything from tobacco to the BP oil spill. Beside the lawyers who think their “professional responsibility” is to ignore the results of their actions. We’re here to call out this funneling process, this soul-sucking vacuum that takes brilliant, passionate, and dedicated humans and turns them into corporate defenders. But it’s not all about the negative. We’re also here to remind you that you are too talented, you are too full of promise, and you have too many options to sell yourself short. Building off of the remarkable success of last spring, we thought we’d openly publish our five goals for the upcoming year. That way, you can know exactly what we’re up to and why. And you can let us know if we’re doing a good job. By the time you learn about what firms really do and who they really defend, it’s too late. Most students sign away their professional lives after only one year of classes they didn’t choose. Perhaps if you had studied antitrust or securities law during 1L, you’d realize what it entails: mind-numbing legal maneuvering that feels pretty close to the criminal activity you’re helping your clients get away with. And that’s when it doesn’t feel like sub-citing the world’s most boring law review article. What does it mean—emotionally, psychologically, spiritually—to waste the vast majority of your waking life doing something you don’t believe in? What does it mean to mortgage away the rest of your twenties (and most of your thirties) in six-minute increments? The way HLS students talk about finding jobs, you’d think they were lepers graduating from massage school. In fact, as Harvard Law students, we have the incredible privilege, luck, and opportunity to attend a world-class institution with unparalleled resources for those seeking to do something (anything) positive with their law degree. Have you ever met with OPIA? These people are ridiculously good at what they do, and they’ll put themselves on the line for you. And under Dean Minow, Harvard’s significantly expanded the Law and Social Change program, launched the Public Service Venture Fund, secured 25 Ford Foundation grants, and maintained one of the most comprehensive loan repayment programs in the country. Simply put, HLS is a great place to do good. For all the administration is doing, much of legal education hasn’t changed since the 19th century. We venture to say that it’s got a rotten core—from the Socratic method to the corporate firms for which our classrooms are named. This broken legal pedagogy, combined with undue BigLaw influence, produces the coercive funneling system we have today. Most 1Ls don’t know it yet, but you’re going to have to sign up for EIP all too soon. Before you have any relevant professional experience. While you’re locked into classes you didn’t choose and locked out of clinics that remind you why you came to law school in the first place. The tragic part is that it’s the same, senseless song, year after year. And that we are all complicit in hitting “replay” each fall. Most 1Ls get their misinformation from 2Ls and 3Ls—none of whom have actually done the work they blithely insist is the only reasonable option. We hope to share our honest and critical experience of 1L with you, as you go through it, and we sincerely hope you make this conversation a two-way process. Firmly Refuse is spreading—fast. Last year, Berkeley Law started its own 60+ member chapter and looks to ramp up involvement this year. Our peers at Yale held similar conversations about firm recruitment and the funneling process, and we can’t wait to reach more law students at RebLaw this spring. We’re already talking to NLG chapters in law schools all across the country, and we’re excited to keep this conversation going at a national level. Justice has become a word we see only in quotes on walls, a word we hear only in speeches recited as students come and leave the school. Yet a different law school experience—a different legal education—is possible. Imagine if there were a conversation on campus about being the most effective advocate for justice. Imagine if we weren’t afraid to ask each other why we’re taking the jobs that we do. Imagine if it were normal to ask your peers what good they hoped to accomplish with their career—and how we could work together to make it happen. We’re Firmly Refuse, and we’ve got some great news: We’re here to start that conversation. Firmly Refuse is a campaign initiated by Harvard Law students, conducted through the National Lawyers Guild. Those interested in getting involved can e-mail firmlyrefuse@gmail.com, or visit firmlyrefuse.tumblr.com. The views in opinion editorials, columns, and letters do not necessarily reflect the views of The Record.